Jacquelynne of The Noble Wife is sharing this beautiful pattern from her November e-newsletter. This is the month of Thanksgiving in the USA, so it’s the perfect time to be counting our blessings. Get the pattern. OMG! The cutest embroidered pumpkin in the world! 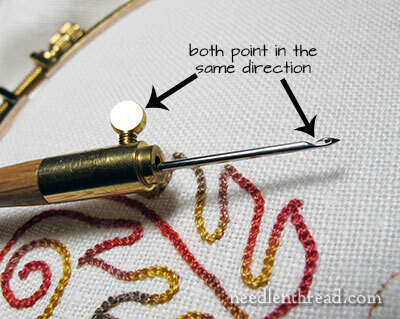 Mary Corbet of Needle ‘n’ Thread shows us how to make one in five minutes with just a few bullion stitches. See her tutorial. Mollie of Wild Olive shows us how to make and stitch these napkin rings, perfect for the Thanksgiving table. Go to her blog post. Your Thanksgiving table needs pompom turkeys. Learn how to make them from Creative Breathing. 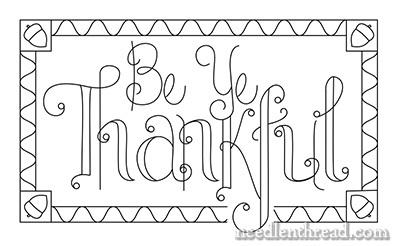 Check out DMC Thread’s Blog for a round-up of Thanksgiving-themed embroidery patterns from around the interwebz. Go to the blog post.